A blog that heralds the art and science of convening people. 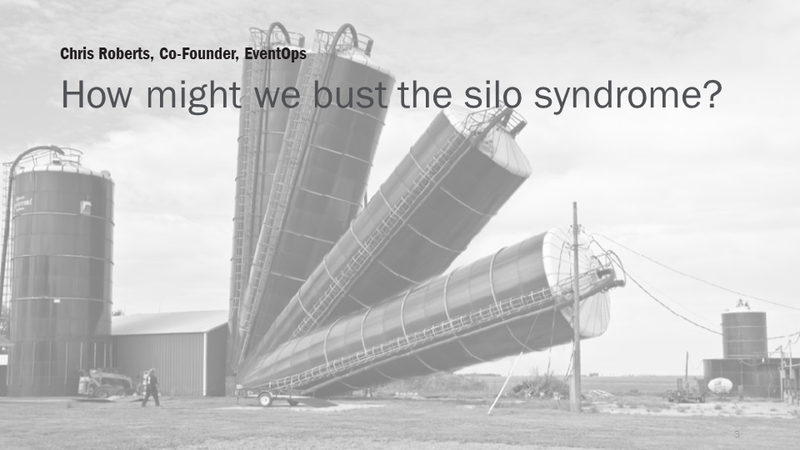 How might we bust the silo syndrome? According to Chris Roberts, Co-Founder of EventOPS, one of the reasons innovation has not become a key efficiency value drive for event teams is a structural limitation within those teams – event teams are often in silos, detached from their counterparts with different responsibilities. This means innovation is severely limited because it’s never considered in a holistic fashion. Event teams want innovation, but don’t work as a team to bring it about. Breaking these silos leads to enhanced collaboration, and an environment ripe for innovation. Discover Chris’s perspectives on driving efficiency, scaling your event(s), making smarter decisions and creating a better live experience. Understand the challenges of creating an entirely new category (“the business of event management”) in such a traditional and fragmented industry. Collaborate on growth opportunities and innovative ideas for EventOPS. Together, we make innovation happen. When you combine diverse perspectives, analytical rigor, and domain expertise, you can transform insights into sustainable growth. I help leaders transform their live events and create new ways to grow in rapidly changing markets. A Job That Can Only Be Undertaken Together!